Colonel W. F. Cody and his Wild West sailed from Liverpool last Saturday and are on their way home, after having spent just one year in England. 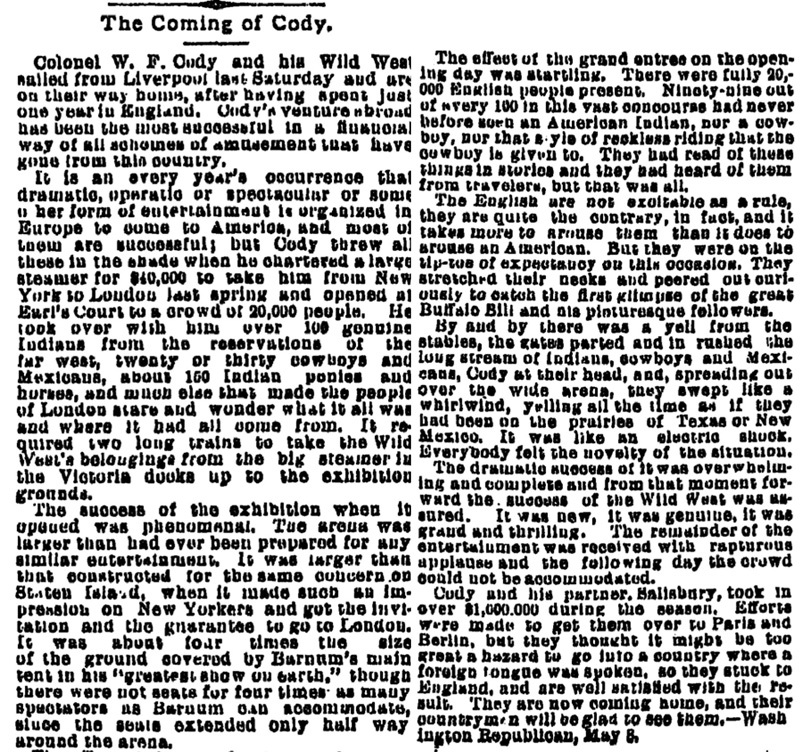 Cody's venture abroad has been the most successful in a financial way of all schemes of amusement that have gone from this country. 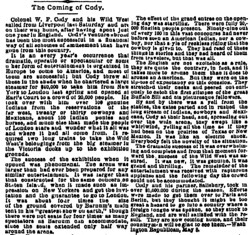 It is an every year's occurrence that dramatic, operatic or spectacular or some other form of entertainment is organized in Europe to come to America, and most of them are successful; but Cody threw all these in the shade when he chartered a large steamer for $40,000 to take him from New York to London last spring and opened at Earl's Court to a crowd of 20,000 people. He took over with him over 100 genuine Indians from the reservations of the far west, twenty or thirty cowboys and Mexicans, about 150 Indian ponies and horses, and much else that made the people of London stare and wonder what it all was and where it had all come from. It required two long trains to take the Wild West's belongings from the big steamer in the Victoria docks up to the exhibition grounds. The success of the exhibition when it opened was phenomenal. The arena was larger than had ever been prepared for any similar entertainment. It was larger than that constructed for the same concern on Staten Island, when it made such am impression on New Yorkers and got the invitation and the guarantee to go to London. It was about fort times the size of the ground covered by Barnum's main tent in his "greatest show on earth," though there were not seats for four times as many spectators as Barnum can accommodate, since the seats extended only half way around the arena. The effect of the grand entree on the opening day was startling. There were fully 20,000 English people present. Ninety-nine out of every 100 in this vast concourse had never before seen an American Indian, nor a cowboy, nor that style of reckless riding that the cowboy is given to. They had read of these things in stories and they had heard of them from travelers, but that was all. The English are not excitable as a rule, they are quite the contrary, in fact, and it takes more to arouse them than it does to arouse an American. But they were on the tip-toe of expectancy on this occasion. They stretched their necks and peered out curiously to catch the first glimpse of the great Buffalo Bill and his picturesque followers. By and by there was a yell from the stables, the gates parted and in rushed the long stream of Indians, cowboys and Mexicans, Cody at their head, and, spreading out over the wide arena, they swept like a whirlwind, yelling all the time as if they had been on the prairies of Texas or New Mexico. It was like an electric shock. Everybody felt the novelty of the situation. The dramatic success of it was overwhelming and complete and from that moment forward the success of the Wild West was assured. It was new, it was genuine, it was grand and thrilling. The remainder of the entertainment was received with rapturous applause and the following day the crowd could not be accommodated. Cody and his partner, Salisbury, took in over $1,000,000 during the season. Efforts were made to get them over to Paris and Berlin, but they thought it might be too great a hazard to go into a country where a foreign tongue was spoken, so they stuck to England, and are well satisfied with the result. They are now coming home, and their countrymen will be glad to see them.—Washington Republican, May 8.